Discussion in 'Digital & Modeling Gear' started by journo, Mar 11, 2019. Got the Axiom with Re-Guitar feature last week and I've been really enjoying it. Re-Guitar is happening! It's a really strange feeling getting a superb 335 neck HB sound when playing a Tyler Studio Elite single coil. I made a screen shot of that very rig that is shown below. I set the source to single coil and the target as a Classic Bucker plus I added Hollow Body and took down the brightness slightly. The amp is a Deluxe where I tweaked the compression characteristics a bit to fit my playing touch. Today I tried a Collings City Limits with Throbaks and while it wasn't quite as successful going to single coil as vice verse, I did get great result with the P90 model. With the Tyler I got great HB sounds including the Ricky Bucker and the Vintage Bucker (Gretsch style) as well as some really nice Tele sounds. What really surprised me in a positive way was how Re-Guitar worked when converting a single coil pickup to another single coil pickup. It was like changing the pickup in my favourite guitar without having to open it up. The Tyler with the Vintage Single turned out to be really nice. I like the amps in Axiom more than I thought I would as I'm a fan of S-Gear. They are different and you can edit the amps in Axiom to a great degree making them sounding good and have a dynamic feel that suits my playing style. The fx in Axiom are many and of good quality. And you can use a lot of them! There are 6 slots pre-amp and six slots post-amp. If that isn't enough you can also fit 4 of them in the input section and four more in the Master section. Oh, did I say that you can run two amps simultaneously with twelve fx slots for each amp? There plenty of speaker models in Axiom but you can import you own IRs if you are so inclined. While I do like S-Gear, I miss not having a booster and a few OD boxes. So when I found out that you can use external VST plugins in the fx slots in Axiom I realized I could use S-Gear inside Axiom and use amps from either plugin or both using both amp signal paths in Axiom. But I could very easily get by using just Axiom and very few guitars. I was so inspired by the sounds I got from Axiom so I started writing a tune and ended up using Axiom for all the sounds in the tune except for the drums. There are presets for electric bass as well so I used Axiom for the bass as well. I'll post the tune as soon as it's done. So now i have spent some more time with the Axiom and the clean sounds I'm getting are really good and dynamic. In my experience clean sounds in modelling solutions are kind of whimpy and weak. Not so with Axiom. I've spent more time with the fx and the usual suspects are present. One pleasant finding was the wave shaper which together with the fuzz allows the creation of some octavia style sounds. The compressor is really good and works both before and after the amp. My personal preference is using it after the amp just like I would in the studio but you can use it before the amp for some authentic country style sounds. The chorus is excellent and the multi-tap delay is easy to set up. I like the spread function where you can set exactly how much stereo spread you want. The reverb is also good. Axiom seems to be coded very efficiently as I was able to run six instances at the same time using presets with processor intensive fx like reverb. I have also been experimenting with using Axiom as a host for other guitar oriented plugins. I used the TSE 808 for overdrive into a Axiom Deluxe amp model in one channel and the Gain fx from Axiom into a Tweed amp in S-Gear, running both of them into the TriStereoChorus from the Amplitube Fulltone Collection and then into the Axiom Multi-Tap Delay and Reverb. And all this without feeling any latency problems. Lots of fun and really easy to put together and all that saved as one single preset. I love S-Gear but I sorely miss having a boost and a compressor in that software. Now I can have everything using both software packages. I love tweaking, but I want easy tweaking and Axiom allows for that. For the past 7 years I have almost always used the Kamper exclusively for recording as I always have thought that was the easiest and most complete package to get my songs recorded. That may now change as the added advantage of the Axiom together with whatever additional software you like allows me to easily put together a lot of stuff in one preset that I can save in both the project as well as in Axiom and use it in recording, and I can change my sounds in minute detail until the very last mixing session. Thank you for mentioning our plug-in. Glad that you like it! Wow that's awesome Blue Cat, I'm really looking forward to trying this. I've been wanting to add a semi hollow but if this gets it even close I'm sold. Added bonus.... I saw the estimate release date was Q2 and well, instead of being at the END of Q2, let alone even inside Q2, it's out in Q1 instead! Nice work! I'm really getting into this plugin! I haven't really appreciated the possibility to leave the final guitar sound sculpting decisions until the final mix before, but with the Axiom this is obvious to me. Apart from the fact that it sounds great, is very easy to understand and edit and is very inspiring. It aslo has good presets that I use as starting points for my own sonic adventures. In short, very inspirational. Here's a tune I wrote using only sound and fx from the Axiom for all the guitars and the bass. Guitar was a Tyler Studio Elite HSS and the bass a Marcus Miller 2nd G V7. Drums were from IK Multimedia SampleTank 4 and Superior Drummer 3. Madmax25, JerEvil and Blue Cat Audio like this. Great stuff as usual Matts. A little off topic but what are your thoughts on the Blue Cat vs the Sim1 XT1 pedal? I understand the benefits of a plugin vs outboard pedal for recording but as far as the actual guitar tones. Regarding your question I was very curious about this as well as I came straight from the Blue Cat demo to the SIM-1 demo at NAMM. I was impressed by SIM-1 for what it is as I'm impressed by Re-Guitar for what it is. My conclusion is that while both products seem to be similar, in my mind they are quite different apart from the fact that one you by as software and the other is software in hardware. So, then how are they different? 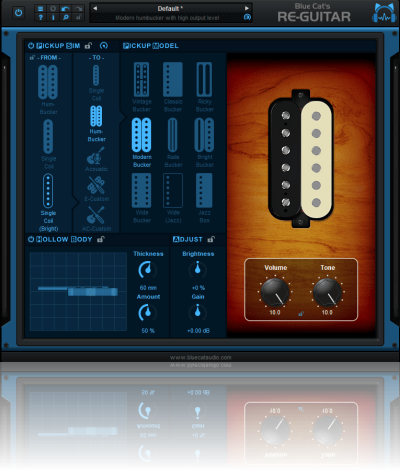 The SIM-1 seem to change one guitar into another whileRe-Guitar rather seem to change pickups in the guitar you play. While there is indeed the hollow body feature of Re-Guitar that works quite well, it doesn't transform the guitar quite as thoroughly as SIM-1. To my ears Re-Guitar also manages better with some guitar than others. It was easier for me to get my Tyler bridge HB to sound like a Telecaster than it was to get my Collings I-35 to sound like a Gretsch. I found it easier to get my Tele to sound like a Gretsch even though the I-35 already is a semi hollow body. With that said there is no winner here. I have place in my studio for both. If I can get any of my guitars to sound like the Benedetto profiled I played at NAMM, that's a clear win and reason enough for owning the SIM-1. But it's also super fun to expand of the guitars I have with Re-Guitar. My Tyler Re-Guitared with a vintage neck humbucker sounds wonderfully warm and full. My Tele tranformed with p90 is raunchy slight OD fit for rock and modern country. As said many times around these boards, it's a great time to be a guitar player.